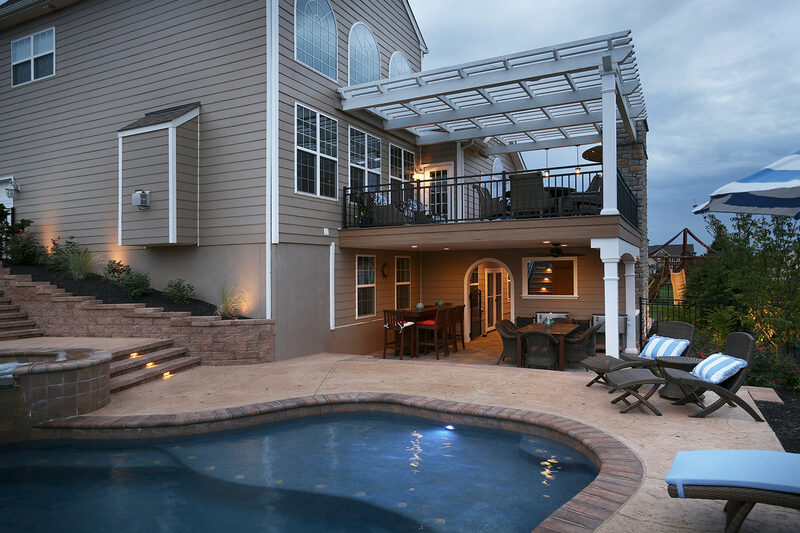 With the backyard only allowing a 15′ deep area to build, we needed to design and build an outdoor living space off both the first and second floor of the home to connect with the existing swimming pool area. 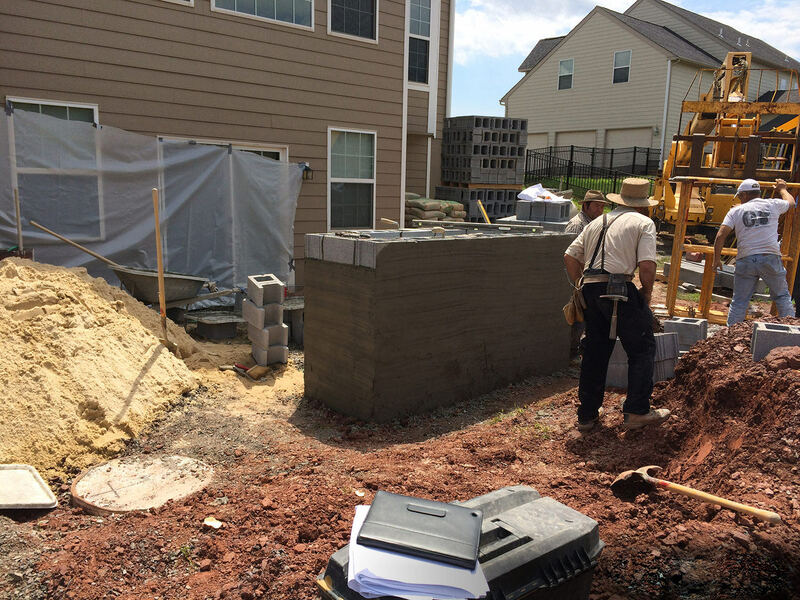 We also needed to take special care and precaution not to disrupt any of the hidden buried pool lines that connected the filter and pool on opposing sides of the property. This backyard had an existing swimming pool, but the rest of the property was in dire need of reimagination! First order of business - remove the existing small and questionable pressure treated deck and uneven stepping stones! Since we only had a defined small space to the property line, instead of building out, we built up! Specifically selected and strategically placed landscaping was key in adding extra privacy from the surrounding neighbors. While the pool was existing, MasterPLAN softened this concrete area with landscaping to give color and textural interest all year-round. Implementing features like ceiling fans are a great way to keep cool in the summer and the fireplace is perfect for chilly autumn nights! 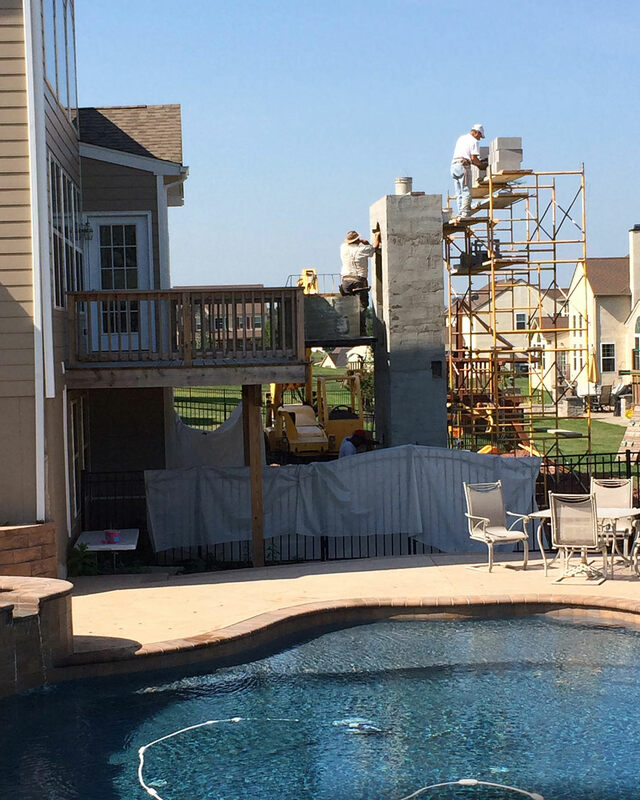 Much care and precision planning went into starting the two-story chase for this project. Everything needed to be exact to succeed! 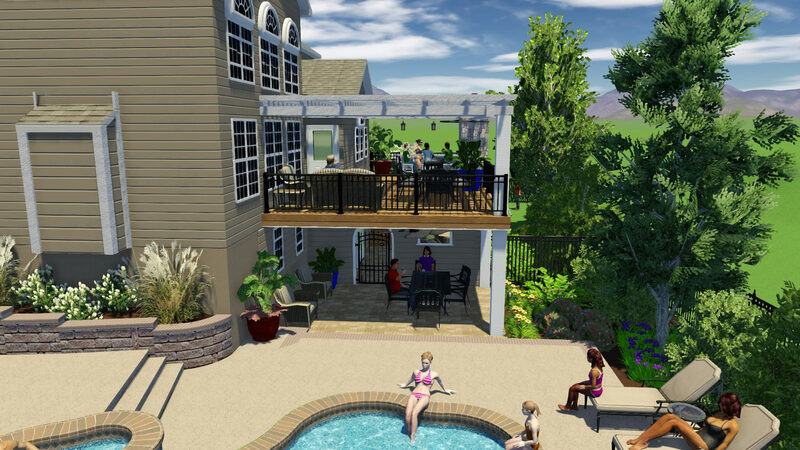 MasterPLAN prides itself in treating your home as carefully as we would our own during the installation phase of your outdoor living project. The attention to detail is second to none on a MasterPLAN project. 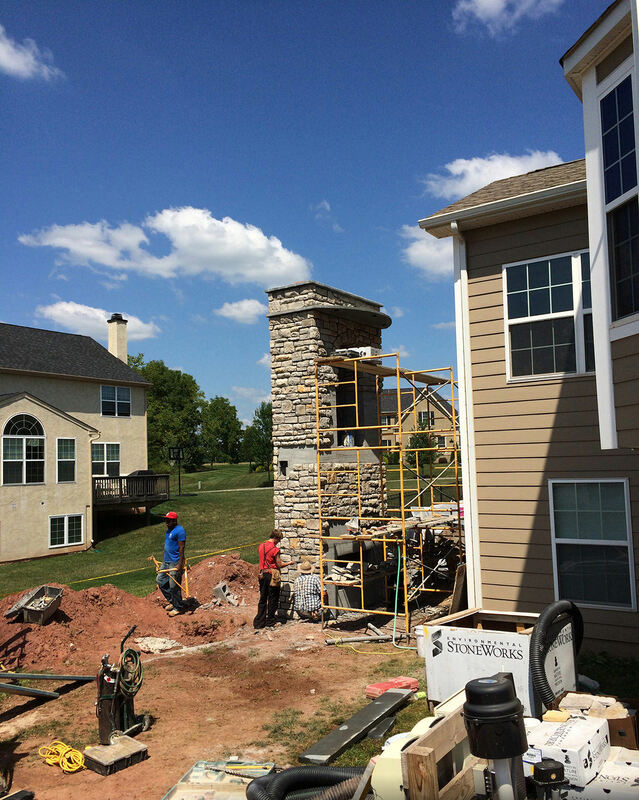 The homeowner was very excited once she saw the stone veneer on the chase, her 3D design was finally coming to life! 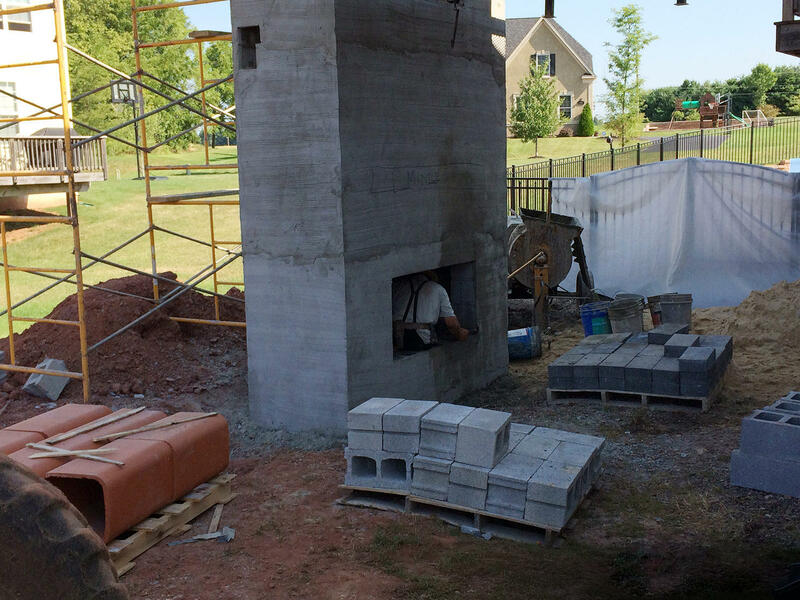 ...and the chase continues to the second floor where it acts as the flue for the outdoor kitchen grilling area! The second-level custom pergola dapples the summer sunshine to keep the dining area cool during the day, and below, the perfect lounge area for those enjoying the swimming pool. This low maintenance switchback staircase effortlessly connects the first and second floor living spaces while not obstructing any surrounding views! This truly was a fun project for us because there were so many moving parts that required attention to detail, but we were up for the challenge! This client wanted to have a lot of features packed into a tight space, yet allow for storage to be present but not clearly visible to her guests. 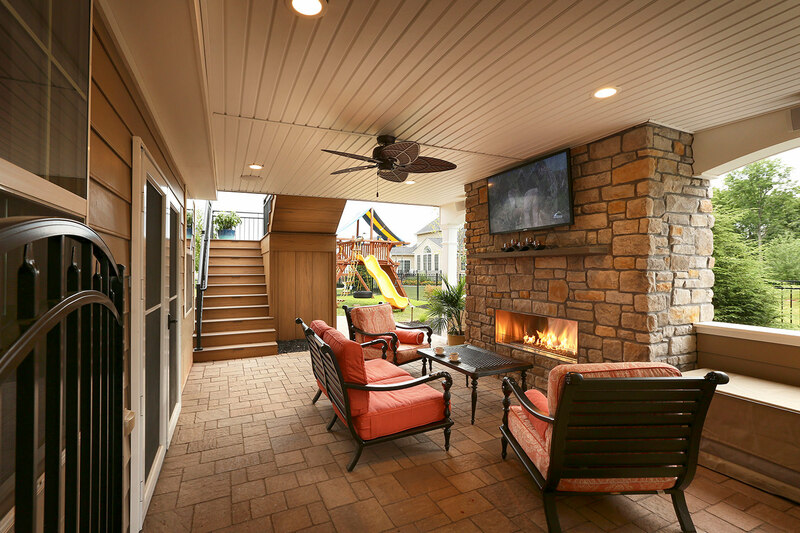 After removing the existing pressure treated deck, we knew we had to break this outdoor living space into rooms to include all of the items on this client’s wish list, without portraying a cluttered or overwhelming feeling. 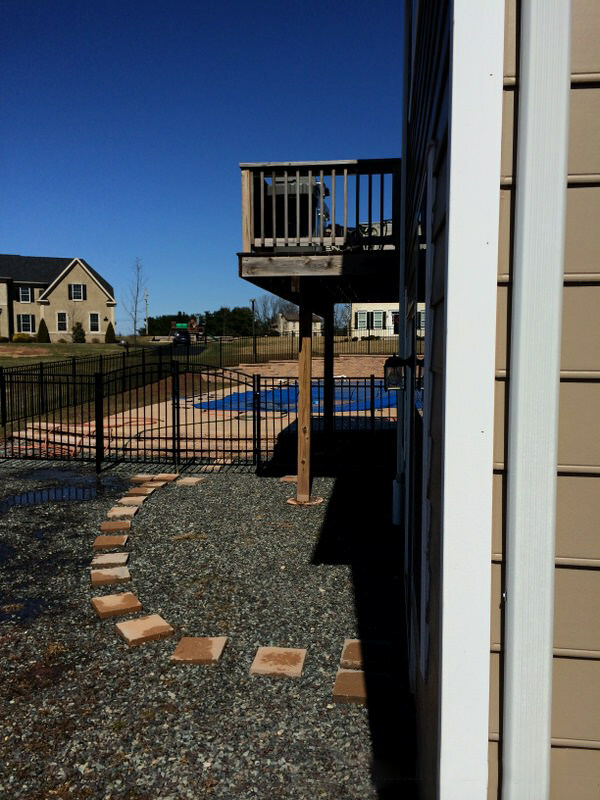 Creating a low maintenance space was in the forefront, which is why we chose to construct the deck out of TimberTech composite decking material. Tying all of the rooms together was also key, so the focal point would be the main chase which houses a cozy fireplace at the basement level of the home, and the grilling station on the top level. This client loves to cook, so we created a kitchen fit for royalty. This kitchen features a stainless steel outdoor grill, a custom glass tile backsplash behind the grill, outdoor rated refrigerator, and plenty of storage. We installed a single piece of rounded bluestone into the chase above the grilling station to cover the cook while they are creating their culinary masterpieces. The bar area in front of the grilling station is constructed with a honed titanium granite countertop and can comfortably seat seven people. We also allowed for enough room on this level to include space for a dining room table and extra chairs to relax in, all under a custom engineered wooden pergola that is completed with LED down lights built into the shade beams. The design for the pergola was minimal with only one post to support it. 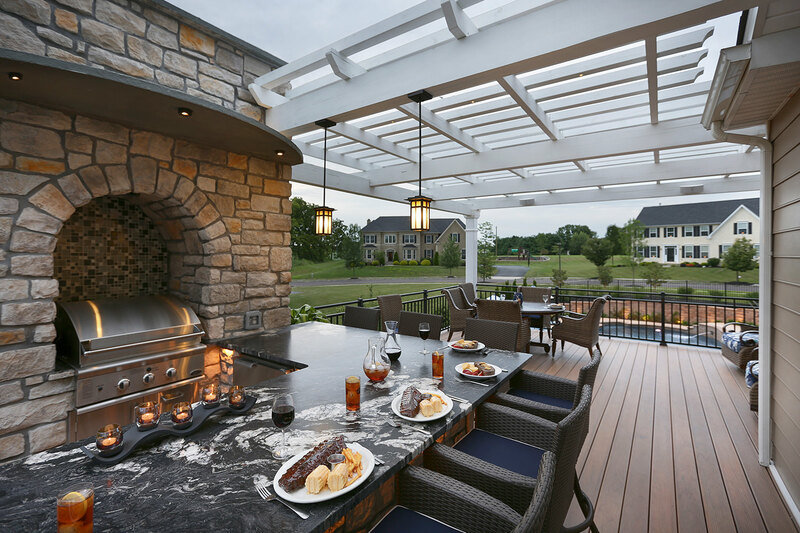 So while the pergola provides structure, there still is an open feeling beyond the black powder-coated perimeter railings. Following the LED lit stairs to the basement level, it would be easy to miss the storage underneath the switchback staircase. This hidden storage area is disguised in the same material that was used for the decking. 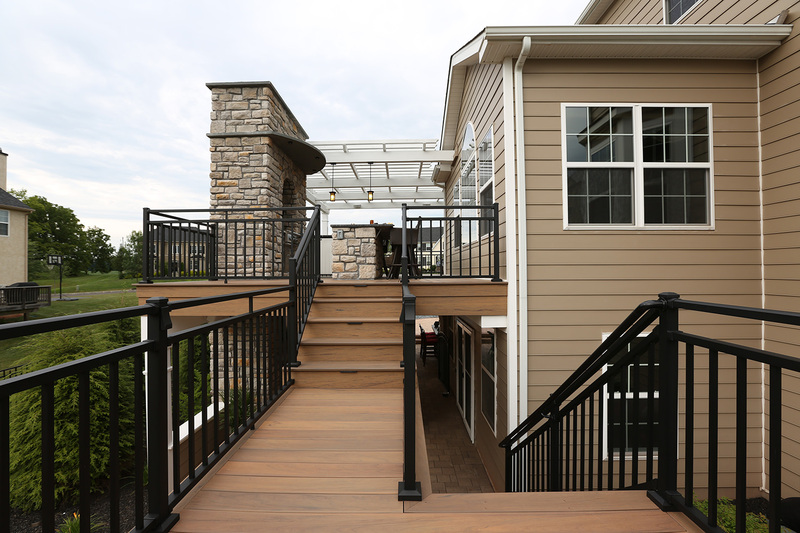 The underside of the deck was outfitted with a water catchment system to create a dry space for uninterrupted relaxation. The ceiling is complete with an outdoor ceiling fan to keep a breeze moving and dimmable recessed lighting to allow for different mood settings while lounging by the gas-lit fireplace. We created a partition in the fence and under deck structure to be completed with a window and a self-closing pool code gate as an extra precaution. 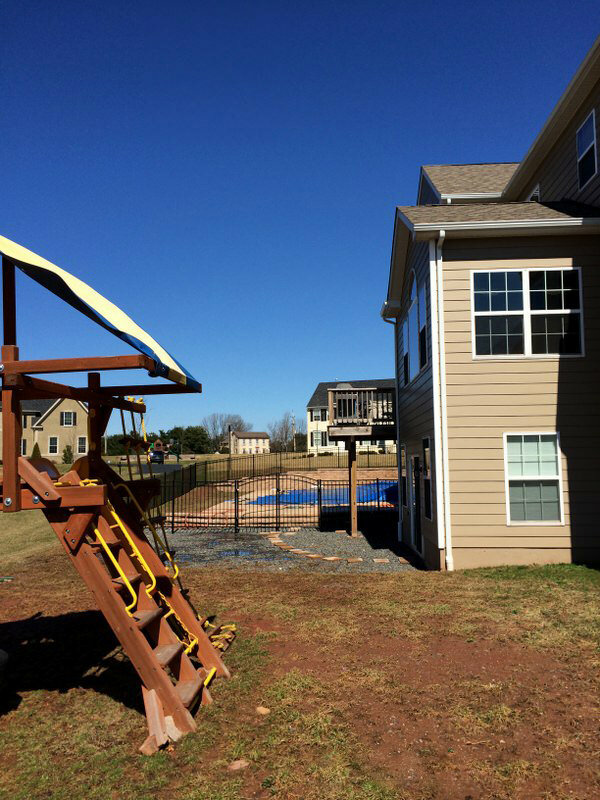 One of our goals was to allow the kids to run free in the yard without a worry that they would be able to play around the pool unsupervised. To finish off the basement area, we installed a Sunbright outdoor rated television above the fireplace with additional speakers above the archways to give the client a surround sound effect. 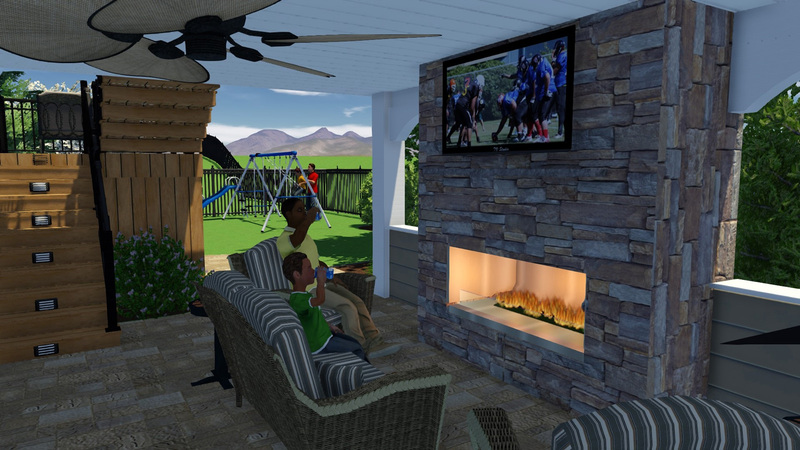 The backyard is complete with a Bose sound system for the perfect entertainment package. To make sure this backyard project doesn’t feel as though it was built years after the home, all design work and materials were chosen to match the existing home as closely as possible. All stone used in the fireplace and kitchen chase perfectly matches the stone used on the front of the house to keep everything cohesive with the look and feeling for the overall project. We were able to take this incomplete backyard area and transform it into a comfortable and beautiful place to dine, relax and entertain! 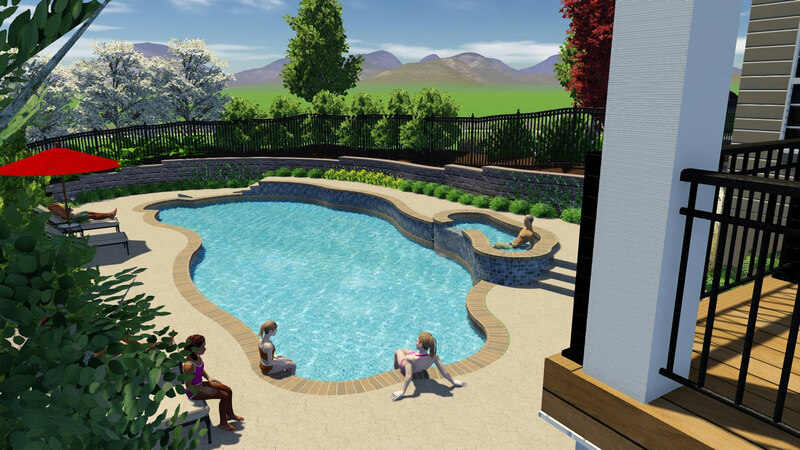 "The final product is an impressive and welcoming backyard oasis that my family and friends will enjoy for many years." “From the time Josh and I first met to discuss the project through the end of the construction, Josh was nothing but professional, knowledgeable and accessible. 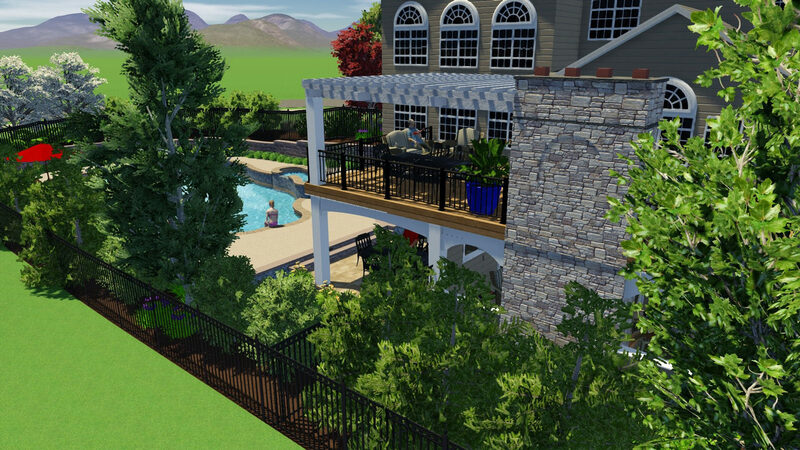 Josh provided a state of the art 3D digital proposal for my patio, deck and pool area and the final product exceeded my expectations. He oversaw all aspects of the project including obtaining the architectural drawings, filing for permits, attending a variance hearing and supervising the multiple subcontractors on the project. Josh was available for any questions or concerns that arose and checked in with me frequently for my feedback and to keep me up to date with scheduling. Josh has a welcome attention to detail and pointed out small changes that made a big difference. The final product is an impressive and welcoming backyard oasis that my family and friends will enjoy for many years.